Go Show the World is based on the lyrics of Kinew’s song Heroes, and pays tribute to historic and modern Indigenous figures of note. Go Show the World tells young readers that Indigenous people are people who matter. 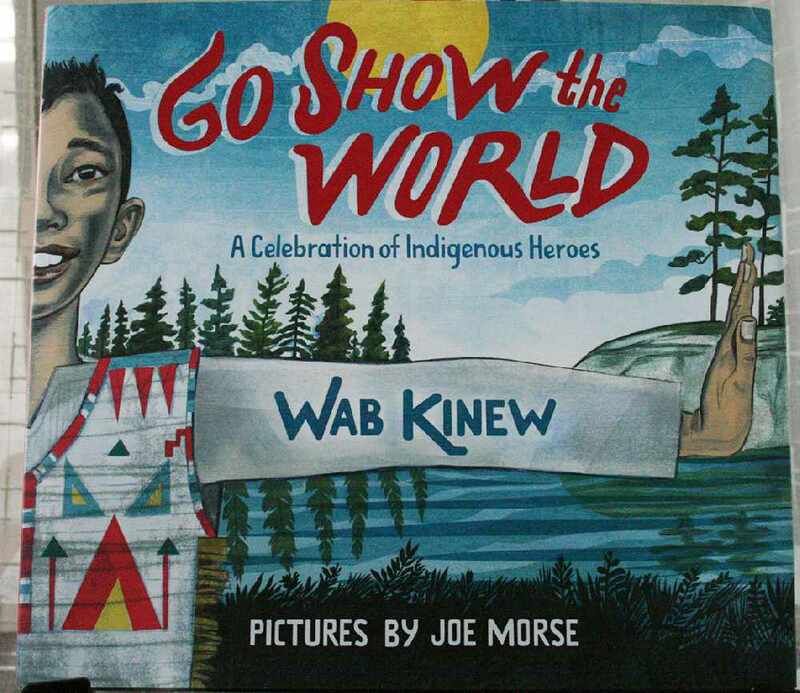 The book demonstrates that fact with tales about heroes from the past who inspired Kinew—Olympian Jim Thorpe, Lewis and Clark guide Sacagawea, and warrior Francis Pegahmagabow are examples—and of modern day heroes, including April Raintree author Beatrice Culleton Mosionier, NHL goalie Carey Price, and Mohawk teen activist and Olympian Waneek Horn-Miller. Other subjects of the book may be less familiar to readers, including Net-no-kwa and Te-Wau-Zee. Themes emerge within the spare text that speak to the tenacity required to overcome personal pain, hardship and hatefulness. Vision, sacrifice and commitment are core qualities central to the telling. The book encourages children to find their own strengths, talents and passions within themselves and then go and show the world what people who matter can do. Joe Morse’s illustrations are large and impactful, impressive and stunning, dignified, yet bold. They are complex with the rich palette of nature’s tones: sky and water blues, forest greens and earthy browns are punctuated with a spectrum of reds. This is a forever book; one that the child can grow with from the youngest age, though it’s recommended for children ages five to nine. Brief, but fuller biographies of the heroes in the back of the book will inspire readers as they mature and will urge them to continue their own exploration of the heroes’ stories and the stories of others into the future.